It is completely the way of thinking and the way of projection. Yes true. It is us who need to stand for ourselves and make our life. When we are clear with the fact that it is our life and nobody has got the right to take charge of it, is the moment when we realize the importance of the valuable moments in our life. Each moment is countable which is owned and governed by us. So why not create our own life, which simply means Make Moments. To create such moments in our story of life we (I and Nitin) planned for Singapore. Few Guidelines have already been shared in my previous post. (Click Here). This post is all about my fun filled two days at Sentosa Island (including Universal Studios). Sentosa Island is one of the desirous and main attractions for which people actually plan their travel to Singapore. I belong to the similar genre of people having huge interest in visiting Sentosa (Marina also in the list). First of all I would clear the confusion people generally acquire between Sentosa and Universal Studios. Sentosa is the name of the island itself. The entire island is Sentosa. Universal Studios is located on Sentosa Island which in itself needs minimum one day of visit. Hence, you need at least two days for your visit to Sentosa Island. It was that first night in Singapore, when we made our visit to Little India and we had plans for Sentosa next early morning. We were looking for the tickets for Sentosa online. I and Nitin, had lots of discussion that night. Now the question is what was the point of discussion on buying one ticket? So travelling to Sentosa is not that easy when it comes to making decision over choosing few from nineteen activities. Yes you read it right! There are total of nineteen fun activities on Sentosa where I have already excluded Universal Studios for the next day. In a Nutshell, I would say if you really want to explore each and every activity, and you are a slow turtle like us in terms of exploring a place then you need to give your 3 or 4 or may be 5 days to ‘Sentosa Island’ itself for which tickets are available accordingly. So here I am to the Rescue. I will help you out in this decision making by telling you my story! My personal thoughts! a. Cable Car is the most expensive way to travel to Sentosa at the same time provides you with fun filled view of the city. So it is all up to your desire if you want to experience one. No doubt you won’t regret it either. One needs to take a drop at ‘Mount Faber’ MRT (Metro Station) to catch Cable Car to Sentosa Island. Cost of which is SG$ 40 per person (this is approximately INR 1850). Cable car is operational from 08:45 AM till 10:00 PM where the last boarding is at 09:30 PM. b. Sentosa Express is a monorail that is connected with ‘HarborFront’ MRT (Metro Station) also known as ‘Vivo City Mall’ till Sentosa Island. The cost of which is SG$ 4 per person (this is approximately INR 185). Sentosa further itself is a large island. Hence, Sentosa Express can be accessed for free inside Sentosa Island from one point to another. Also, to inform you that returning via Sentosa Express till ‘HarbourFront’ MRT is not chargeable (one needs to buy MRT ticket just for entering via Sentosa Express). 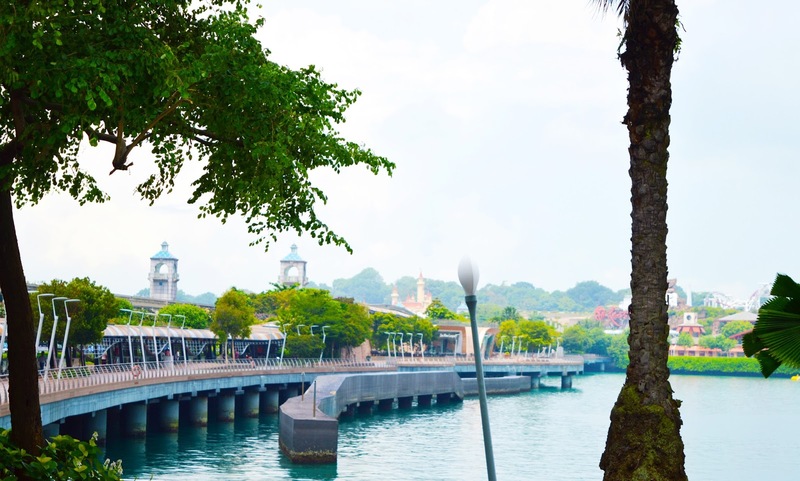 c. Sentosa Boardwalk is another way out available to enter Sentosa Island for free. No entry fee is required for the boardwalk. Also the boardwalk is just 1 to 1.5 kilometres long by walk which is also properly covered. For a true traveller, I don’t guess it’s too much Sentosa is asking for. So, as you might have guessed it already, Sentosa Boardwalk was chosen by us. For the return from Sentosa to HarborFront, we took Sentosa Express. As already conveyed Sentosa Express is free for the returning passengers. Play Max Fun Pass lets you access all the 19 attractions for 1 day from 9:00 A.M. The cost of this pass is US$ 80 (this is approximately INR 5300 per person). 4D Adventure Land: Desperados, 4D Adventure Land: Extreme Log Ride, 4D Adventure Land: Journey 2: The Mysterious Island, Bi-Pedal Bicycle (1 hour), Butterfly Park and Insect Kingdom, Fort Siloso. 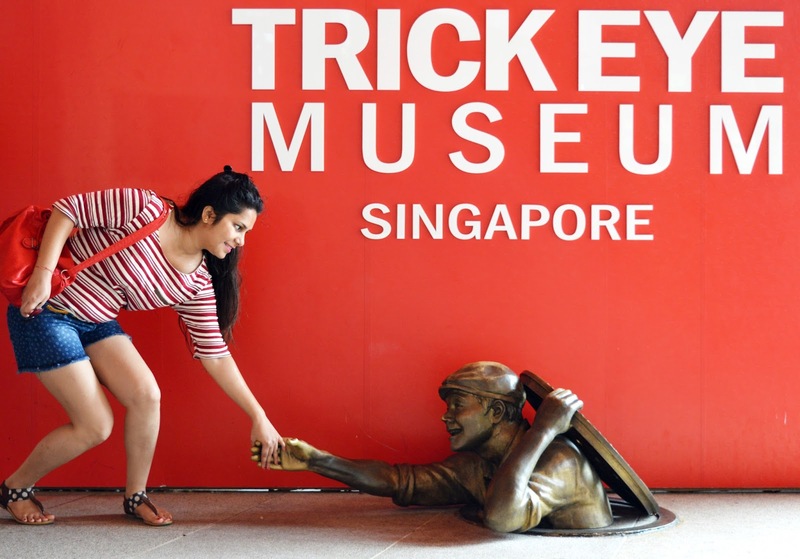 Parajump, S.E.A Aquarium, K- Live Sentosa, Segway Fun Ride, Sentosa Merlion, Skyline, Trick Eye Museum, Sky Tower, Wave House, Wings of Time, Images of Singapore Live, Madame Tussauds, MOSH! 5-Attraction Day Fun Pass lets you access 5 attractions of your choice for 1 day. Attractions of your choice to be chosen from the list mentioned above. 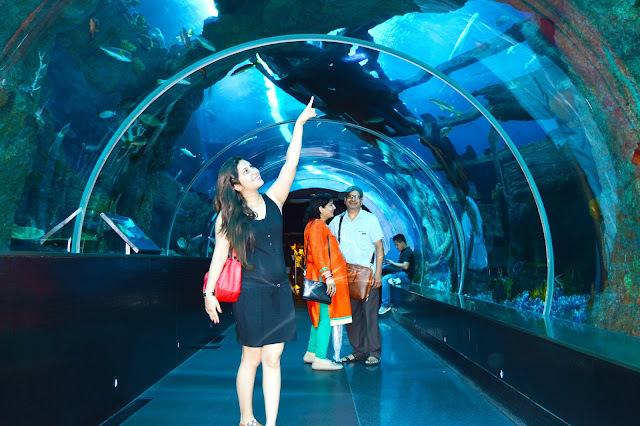 Cost of 5 Attraction Day Fun Pass is US$ 45 per person (this is approximately INR 2900). 3-Attraction Day Fun Pass lets you access 3 attractions of your choice for 1 day. 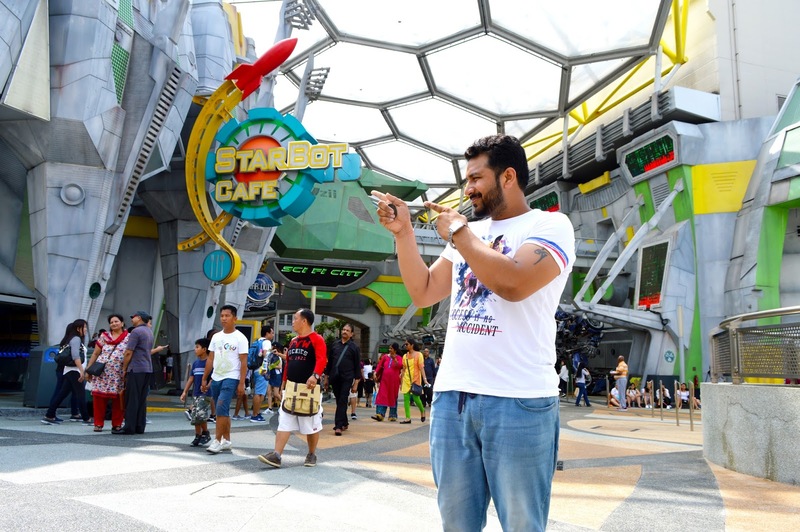 Cost of 3 Attraction Fun Pass is US$ 34 (this is approximately INR 2200). Yes this is the one I chose due to time constants. Truly speaking, this proved to be best for one day for us. Let me explain how. All the attractions in Sentosa Island are executed at their fixed time. Also, each and every attraction is located at some distance from each other. The first timer obviously is going to consume some of its time in finding the location and reaching out there on time. Honestly speaking S.E.A. Aquarium topped the list out of all attraction for NitSa. Another attraction of interest for us was ‘Wings of Time’. Both these attractions were chosen by us as per our own taste of interest and also reviews online. We never wanted to skip these two from the very beginning. The third attraction was not required to be opted. 3-Attraction Fun Pass comes with a deal which says that if you chose S.E.A Aquarium then you have to visit K-Live show as your third attraction. So K-Live somehow became our third attraction. S.E.A. Aquarium We were at Sentosa Island at around 10:00 AM. Going by the map of the Sentosa Island we headed to S.E.A. Aquarium. It is located nearby to the Boardwalk. As soon as we reached to the end of the Sentosa Boardwalk, we took right as per the map. ‘Trick Eye Museum’ was located to the very right. Moving further following the same lane, we reached S.E.A. Aquarium. The view inside gave us all the relief from hot weather we were experiencing outside. S.E.A. 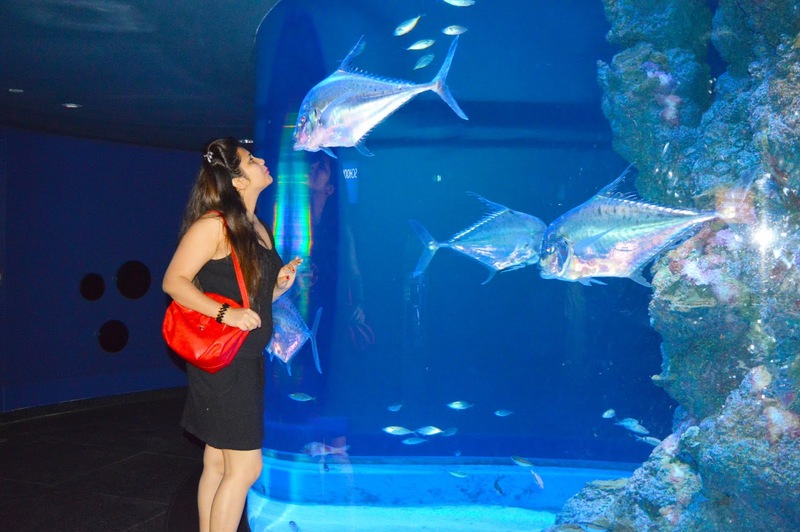 Aquarium is operational from 10:00 AM till 07:00 PM daily. Rest of our shows timings was different, so we headed here first. There were hundreds of categories of flora and fauna of sea life. Remarkable! To be very honest, we could easily spend more than 2 hours there. The next time we saw clock it was 01:00 PM and still we were left with few of them. Dolphins, Crabs, stingrays, reef fish, Sharks, Longhorn Cowfish, squirrel Fish, Soldier Fish, Tortoise and many more. We also got the chance to touch and feel some of the species for example Star Fish. There was a long line at ‘touch and feel’ pool in SEA Aquarium. One by one we were passing by each and every frame and were amused by the creativity and collection. Then came the moment when we reached that part of SEA Aquarium where there was an enlarged frame. Few snacks vendors were also located there including popcorns. An indoor fine dining restaurant was also available there, to the very left. That was surprising. Souvenirs shop is also located at the exit of SEA Aquarium. 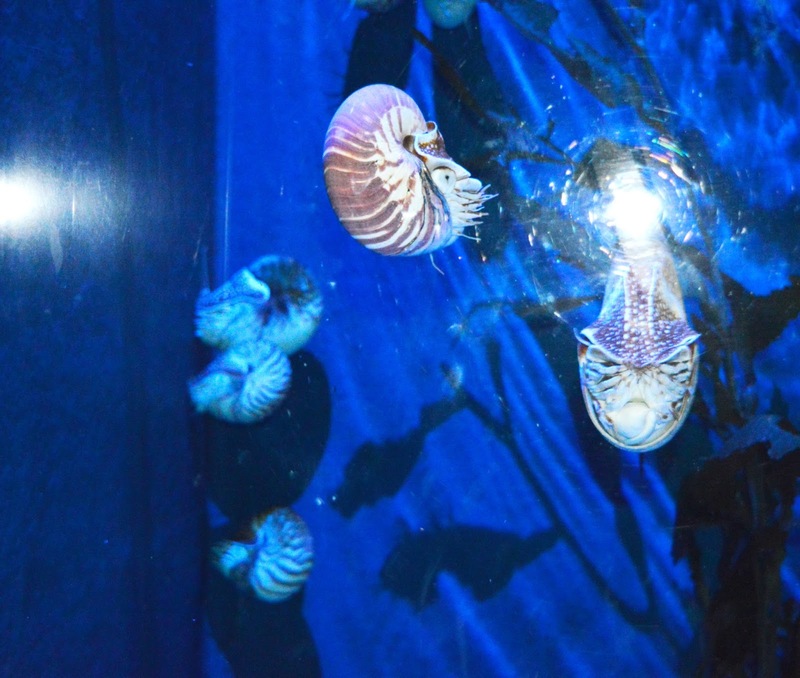 K- live Sentosa is located nearby to the SEA Aquarium. It is 40 minutes long show. The show timing was 05:00 PM, 06:00 Pm or 07:00 PM. Meanwhile we had fun time at Sentosa Beaches. 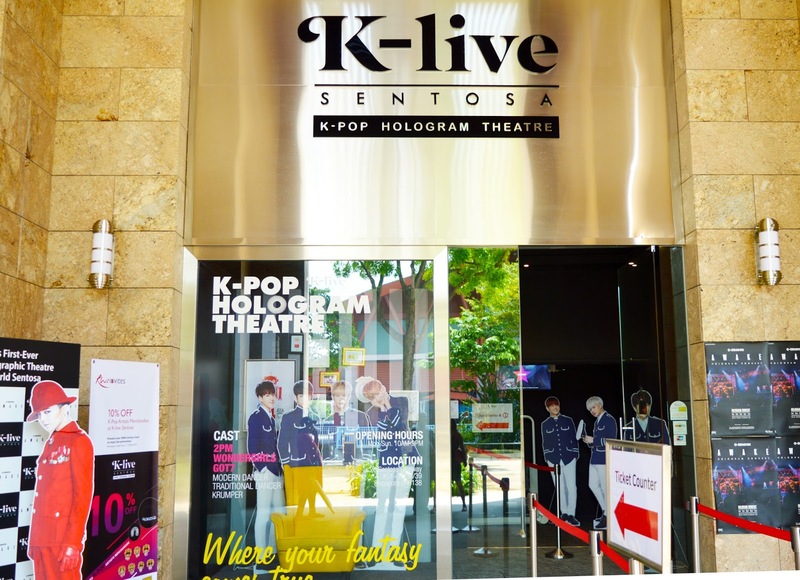 After having our lunch (about which I have mentioned below in ‘Eating Options at Sentosa’ Column) and fun time at Sentosa Beaches (details coming soon), we headed straight to K- Live show which was unintentionally added as one of three attractions because of SEA Aquarium. It is a Hologram Theatre in Singapore that features K –pop stars. Hologram technology let K –pop Stars perform at their best convenience and interact with their fans. Our next show ‘Wings of Time’ was to be started either at 07:40 PM or 08:40 PM. K-live stadium is at ‘Resorts World Sentosa’ Station whereas ‘Wings of Time’ is located at ‘Beach’ Station for which we need to take Sentosa Express. So we preferred the 07:00 PM – 07:40 PM show at K – live and 08:40 PM show for ‘Wings of Time’. The music of the show was full on lively. One would love to dance on it. There were no seating arrangements was one drawback as per me. It is not necessary that all would love to stand and dance for the entire of 40 minutes. The management did provide with 3 or 4 chairs for the oldies in the audience on demand. 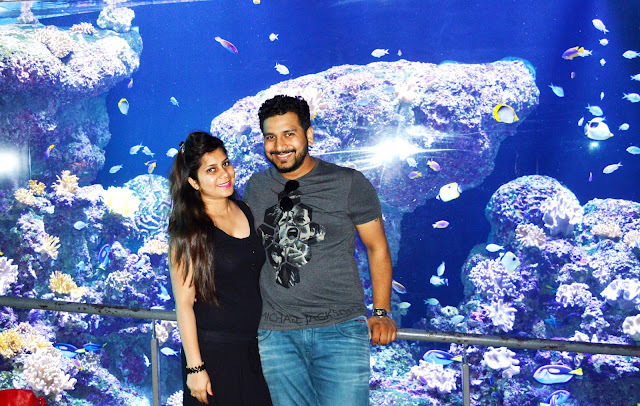 To be very honest in terms of reviews, our expectations after SEA Aquarium were quite high. So K- live show didn’t meet our expectations up to that level. Wings of Time is a night show which is available daily at 07:40 PM and 08:40 PM also. So you can make your choice of time as per your comfort. The duration of the show is 25 minutes which is worth the entire wait for the day. The show is organised at Silosa Beach and seating for which is also outdoor. We took Sentosa Express to ‘Beach Station’ from ‘Resort World Senotsa’ Station after completing K – Live show. ‘Wings of Time’ is located to the left at the exit of the ‘Beach Station’. There was huge public waiting outside for the show. Our show timings were 08:40 PM. It was a water and light show where the showers of water were also falling on us in between. The show was truly commendable. It was a story of two friends, a mysterious bird and their time travel journey. Fireworks at the end just enhanced the beauty of the show. a a. The tickets are non-refundable despite of weather condition because the show will go on. b b. The seating area is quite large, so it is a good idea if you plan to reach early. In between our fun time at Sea Aquarium and K - Live from around 02:00 PM to 06:00 PM; we searched for decent food options at Sentosa Island (Vegetarian option where we can take our parents also). Otherwise there are lots and lots of restaurants available to dine at. They are little expensive too. So again it is all up to your wish what and where you would like to eat. We were in search of a decent vegetarian option which is also feasible at the same time in terms of money. There we got ‘Mc Donald’s’, ‘Marry brown’ and ‘Toast and Club’ eating options all located adjacent to each together. As soon as we took a drop at ‘Beach Station’ via Sentosa Express, we made our exit to the right. There we found all these restaurants available. Toast and Club restaurant served us with a proper meal which included one mix vegetable, Chana Masala, Curd and Chapati. Amazing vegetarian search I must say. Made my Day! Sentosa doesn’t end with the fun filled shows and fantastic Universal Studios, it also has got lovely and romantic beaches. 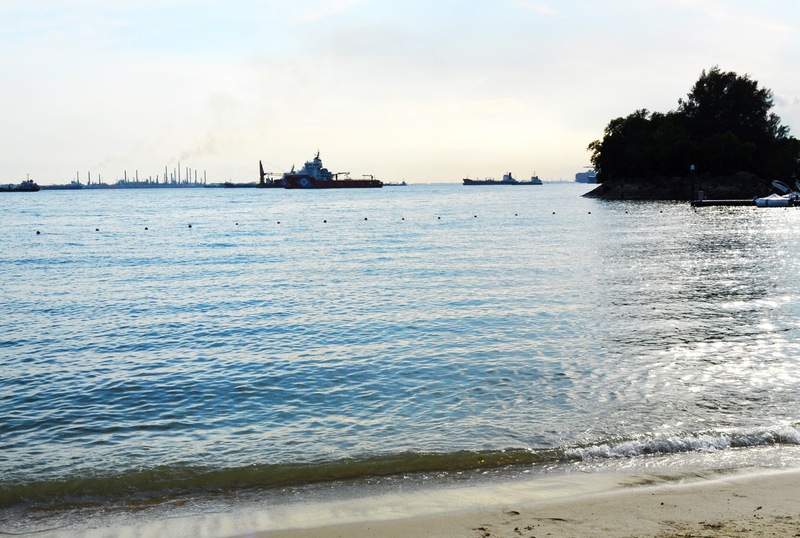 These beaches are located at ‘Beach Station’ which can be reached by travelling through Sentosa Express. This is something which is missed by large number of people visiting Sentosa. 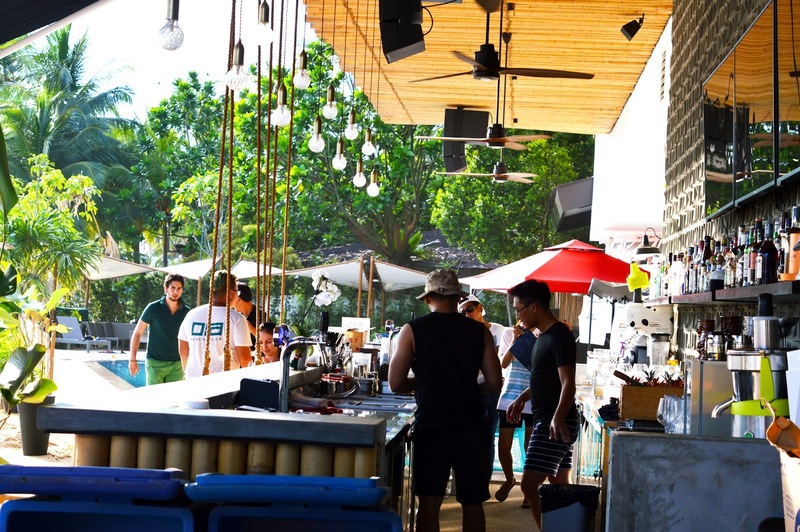 The reason behind missing the opportunity to visit these beaches is the Fun Shows at Sentosa. In urge to experience more and more of activities, people generally keep their entire day busy in these lined up shows. Because Fun Pass comes with a compulsion to be consumed within one day. 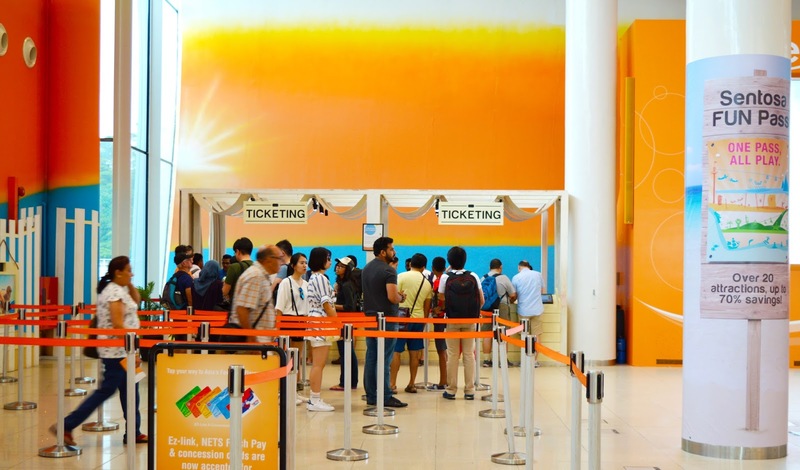 Each activity also comes with an individual ticket that can be bought at the ticket centre. So don’t hustle for the large number of FUN Pass. You can obviously buy an individual ticket at the ticket centre located just outside the stadium of that show. The three beaches namely, Silosa Beach, Palawan Beach and Tanjong Beach. Silosa Beach is the most fun filled beach among all. Whether day or night, one can hip hop at the bank of this beach. There also exist the bars and the restaurants which I found the coolest among all. The location is also superb. One can enjoy the Sun bath or can enjoy the dip in the ocean. Walking on the white sand on the bank of ocean with Nitin was the most enjoyable activity for me. Playing with water and throwing on to each other is so much fun. There was large number of people enjoying Sun Bath at the bank side. At the end of the beach when we were taking exit from there with our shoes held in our hands and legs all covered with sand, we saw one ‘tap pole’ where people were cleaning themselves from the sand. It was truly wow. This is why I say, that I love the management of Sentosa. Before you land up back on the floor of Sentosa, they allow people to clean off the dust. This is another reason which clearly shows their will to keep their city clean. Beach activities including skim – boarding, cycling, rollerblading, and many more exciting deals. Even during night time, they come up with beach parties and fun filled music. So there is lot more than buying Fun Pass for Sentosa activities. Chose what suits you best. Whatsoever you chose, it is all worth it. Another two beaches, Palawan Beach is a kind of Family Friendly Beach and Tanjong Beach especially for couples who are here to enjoy their time together in a calm and peaceful place. It is more romantic at night. To be very true, one day at Sentosa was full of fun but tiring to the utmost extent, especially for the elder ones. So after reaching back to our place of accommodation we all decided to give a break to Sentosa and plan for Universal Studios after one day. 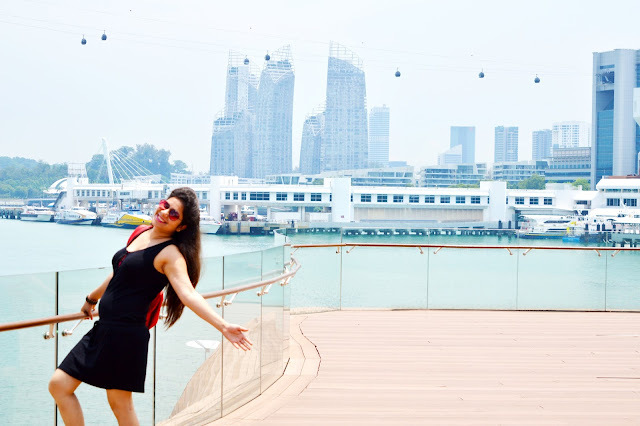 For that one day we planned our trip to Marina Bay Sands and its nearby beauties (the story about which will be shared in another post of Singapore). 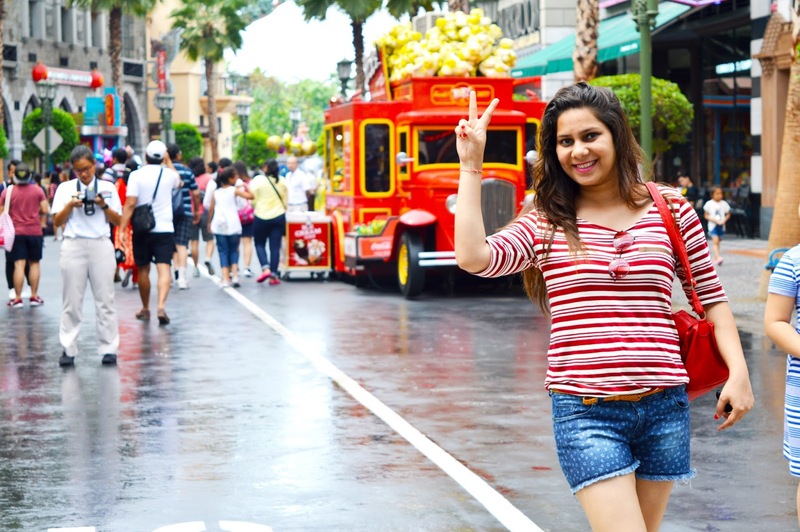 After completion of the Marina Day, I was all excited for experiencing Universal Studios. We need to follow the same route again as already conveyed that Universal Studios is part of Sentosa Island. But it has got all together a new and different concept for the visitors as compared to Sentosa activities. 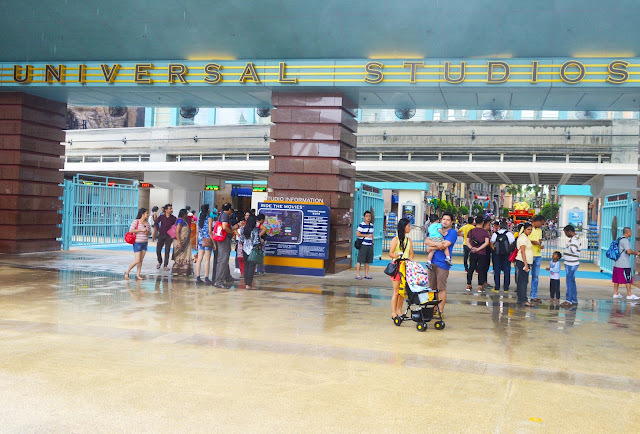 Cost of Universal Studios Entrance Ticket and What is Express Ticket? 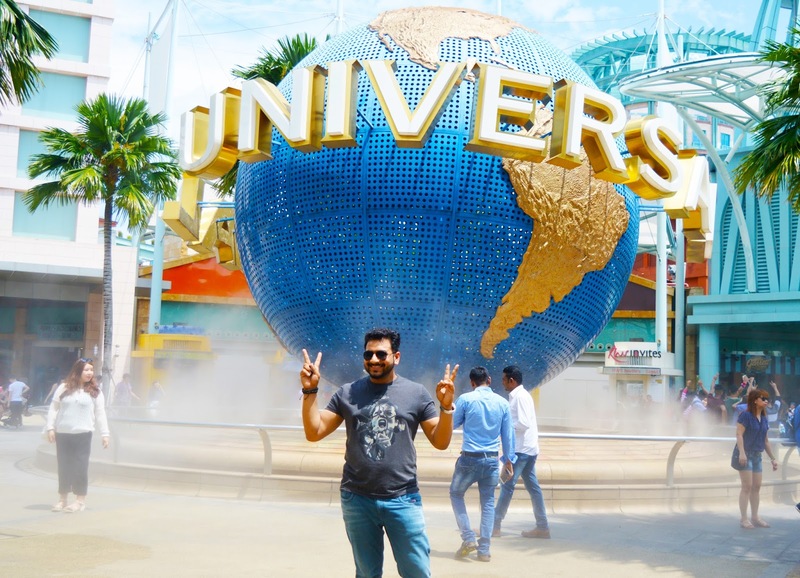 The entrance ticket to Universal Studios is SG$ 76 (this is approximately INR 3500) per person inclusive of all rides. To inform you in advance, there also comes one express ticket to Universal Studios. What is the difference between the two tickets and why would one need to have it? The answer to these questions follows as: There is hell long queues at Universal Studios. It has got long queues to the extent that you may end up with a waiting hour of 2 to 3 hours at one fun ride. It depends upon season to season. But long queue is apparently going to make you more tired and time consuming that leads to irritation and missing few of your rides. To save you from all these drawbacks, Universal Studios came up with the Express Ticket. All the rides at Universal Studios have got three types of entrances. First one is the basic general entry line, where the non- express ticket buyer will be queued up one after another. So if you have got the ticket amounting to SG$ 76, you will be headed to this lane. Second lane is for the Singles. If you have no issues taking rides alone apart from your companions, then this lane can do wonders and you can experience more and more of the rides. Third one is the lane for Express Ticket Buyers. Express Ticket lets you get in to the very beginning and can save your lots of time. It is a kind of privilege pass for which you need to pay extra. Everything seems alluring till now but the pain comes when we get to know that extra pay for the express ticket. ;-). Yeah. It is way too much. So I will again quote my all time statement that it is all up to your desire and your pocket. Chose whatever suits you best. In a nutshell, Singles and Express Lines are the fastest lanes. And yes, one more valuable thing to be known is that whichever ticket you go for, there is no bound on number of times for any ride inside Universal Studio. It was very early morning when we were getting ready for Universal Studios. The weather was awesome and romantic I must say. It started raining when were on the way to Universal Studios inside MRT. It never rained so hard and it was the only day in the entire trip to Singapore that it rained so heavily. But as everything is covered over there we managed to reach Universal Studios. Even the Sentosa boardwalk is fully covered; we could easily get in and reach the Entrance of Universal Studios. Unaware about Universal Studios we were somewhere inside us, thinking about going back. We had a perception that it has got lots of rides which might get stuck in rain and other related notions were coming to the mind. Ha Ha. I am now laughing at my own thoughts that were coming at that time. But that’s not my fault. I was not known to Universal Studios till now. It stopped raining in less than one hour. As per my experience, it never rains for more than an hour in Singapore. Trust me! We were inside Universal Studios at around 10:30 AM. The entrance itself made us feel like a different country altogether. The building and the lanes, we were in different world. Stupendous! At the very entrance was a Popcorn Van, which was the first thing that was attracting me because I love corns in any way. It may be popcorns, sweet corns, and baked corns, whatever. I just love them. Taking pictures we cannot forget now. Seriously we got so much involved in the scenic beauty of the Universal Studios for some time that we forgot about the rides. We were stepping further at such a slow rate that we did not want to leave even a single bit of it. Outstanding Architecture! Moving on further, we approached the rides entrances. We then realized that every ride is covered under a roof. There is no chance of getting stuck in rain or may be closure of rides. That amazed me again with their management. I am more in to love with it. One by one we started taking part in rides and getting in to the queues. What was the luckiest thing was that the queues were not that long. May be the Season we chose for the trip did wonders or may be local people cancelled their plan for that day due to rain. I don’t know what did wonder but whatever happened, was for good. The rides at Universal Studios are based on stories of silver screen that are created and innovated to let us experience in our real life. We got to experience the thrilling magical stories while rolling over on to the roller coaster. As well said that ‘Go beyond the screen and Ride the Movies’, is what Universal Studios is aimed at. 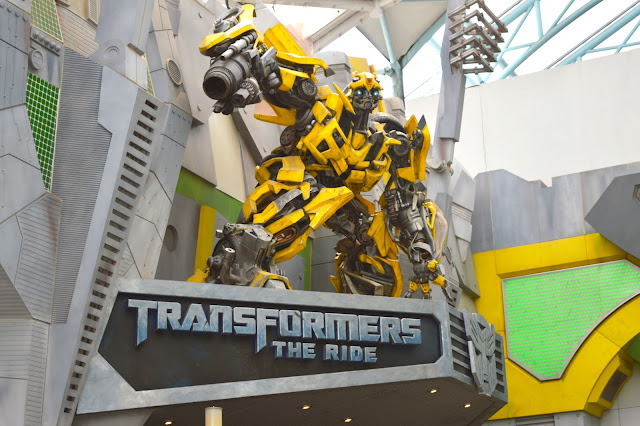 The attractions are all based on the famous Television Serials and Movies which includes Transformers, Jurassic Park, The Mummy and many more. One can’t judge the fun and the creativity they assure to provide us without experiencing them personally. Marvelous! 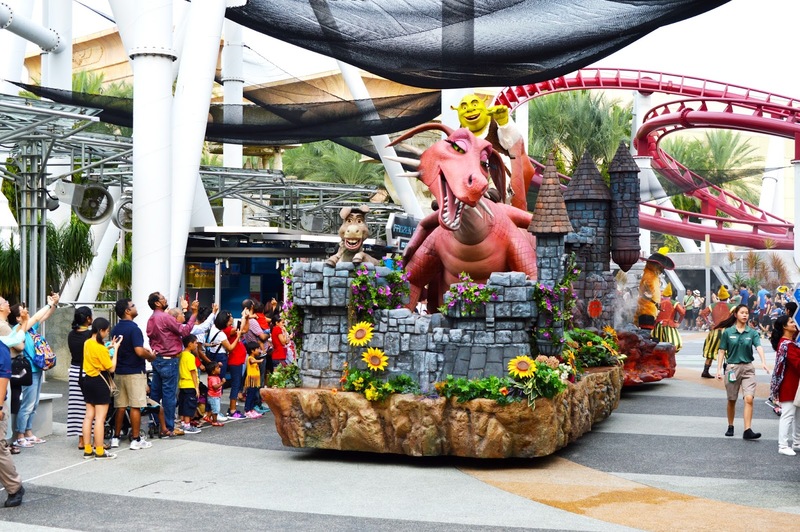 It is a Theme Park hence, which is located within ‘Resorts World Sentosa’ at Sentosa Island. Hollywood is known for its lively architecture, palm trees and the Walk of Fame. The lane of the Hollywood Zone itself made us feel like in the different world. From among the shows ‘Sesame Street Show’ is a singing - dancing show and ‘Spectacular firework show’ is held on selected Saturdays. So Plan your visit accordingly, if possible. There we also enjoyed two of the street shows among which ‘The Cruisers’ was just rocking. Another one was ‘Mel’s Dinettes’. We also got the chance to meet the Universal Cast of characters at the ‘Hollywood Walk of Fame’ and ‘The Minions’ was just super cute. Here I got the chance to get pictured with my favorite Minions. I love Minion! Yippee! 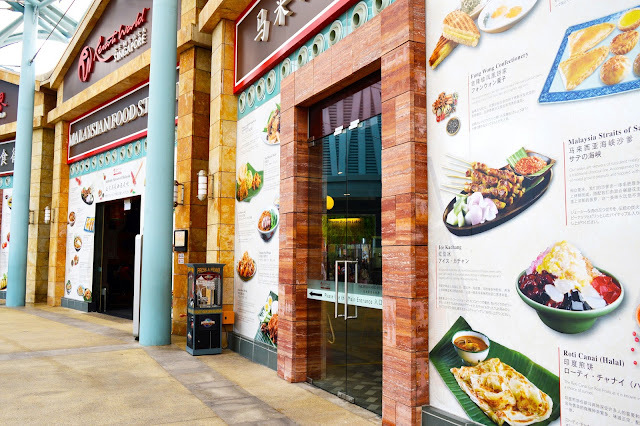 Hollywood also comes up with lots of dining and shopping options which includes the famous Starbucks and China Bistro. Get in for the perfect Hollywood experience. We were lucky enough to get the chance to witness the Hollywood Parade. Spectacular! It blocked all the ways of Universal Studios. People from all over the Studio gathered around this parade. It was one of the liveliest things that happened at Universal Studios. New York is another zone which comes up with the rides on varied themes liked and enjoyed by kids a lot. ‘Sesame Street Spaghetti Space Chase’ comes up with a ride that took us on a space mission and gave us a chance to meet all the Sesame Street characters. Full on family ride would be enjoyed a lot especially by kids. Sci – Fi City is a zone of future that focuses on battle of Good vs. Evil. Don’t miss a chance to take a ride on ‘Transformers – The Ultimate 3D Battle’ in any way. This was the most amazing ride we had at Universal Studios overall. The ultimate experience it gave us was unforgettable and was like ‘No one can ride just once’. The creativity and the talent of the people involved in its development are worth appreciating. It is just not ‘The Transformers’ but the overall concept of Sentosa Island (including Universal Studios) is worth appreciating. ‘BattleStar Galactica’ is another roller coaster at Sci – Fi City that is going to give you lots of twist & turns. It is known for being the world’s tallest roller coaster till now. The thrilling part of this coaster is that the two rolling coasters ride side by side and race towards each other. Riders need to be at least 125 cm long to be eligible for this roller coaster. Another ride ‘Accelerator’ is a ride that goes round and round and which is not my cup of tea. I cannot go on such whirling rides. It makes me feel dizzy. I am so sorry ‘Accelerator’, I am sure you must be one among the best which I did not experience. Among eating options, there we found one ‘StarBot Cafe’ and ‘Stardots’ ice cream parlor. 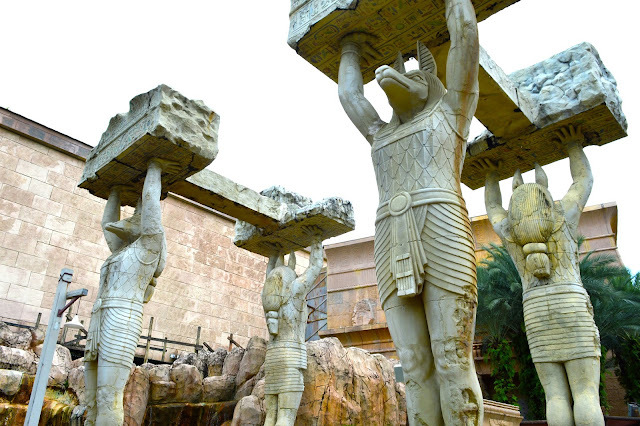 Ancient Egypt is a historic zone which takes you to 1930’s which comprises of ‘Revenge of the Mummy’ roller coaster ride where we were taken into the darkness with variety of mummies inside and other fighters. This is another Not to Miss ride from my side. Another ride especially for kids ‘Treasure Hunters’ that takes you on motor car ride to explore the Egyptian site. There is one restaurant for dining purpose named ‘Oasis Spice Cafe’. It is an Egyptian based buffet that was also serving Vegetarian Thali. It proved to be one of the relaxing eating options for all of us. It has got both indoor and outdoor seating arrangement. We preferred the outdoor option. The lost World is divided into two themes namely, Jurassic Park and Water World. It included activities like ‘Amber Rock Climbing’, ‘Canopy Flyer’ and ‘Dino – Soar in’. This is more like a kid’s special zone. So do not forget to take your kids to this zone. They are going to have fun for sure. WaterWorld is a live water show performed on a stage that is set on a large pool of water. This show is based on a blockbuster film ‘WaterWorld’. There we witnessed real fire explosions and lots of stunts alive which we had always seen in movies till now. This show is performed only once a day, so make sure to know the timings in advance and be there on time. Far Far Away is another kid’s special zone which comes up with the number of rides. ‘Puss in Boots Gaint Journey’ and ‘Enchanted Airways’ is among the roller coaster rides that belong to this zone. ‘Magic Potion’ is spinning wheel ride for children. 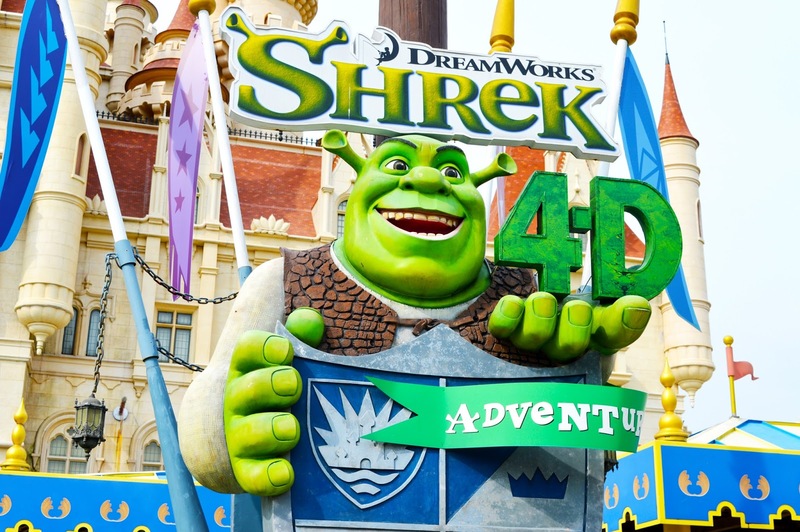 ‘Shrek 4D adventure’ and ‘Donkey LIVE’ are the two live shows of this zone. Both of these shows belong to movies with animated character liked by kids. Do not forget to enjoy the Fairy Godmother’s Juice Bar and Friar’s Ice cream treat! Madagascar zone was based on the DreamWorks Animation Film. It took us to dense jungle which comprises of strange animals and creatures. Do not forget to take a boat ride with the Madagascar heroes at ‘Madagascar – A Crate Adventure’. 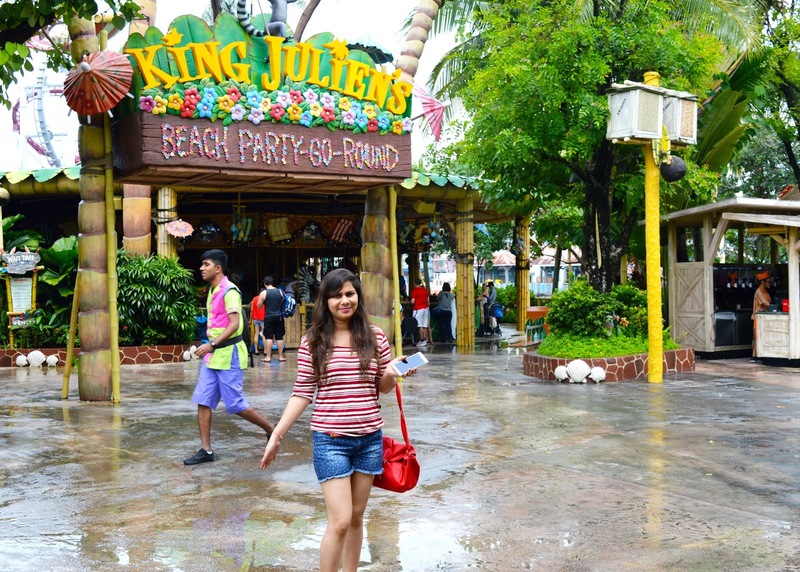 Another go round ride named as ‘King Julien’s Beach Party-Go Round’ also belongs to this zone (and also not my cup of tea again). 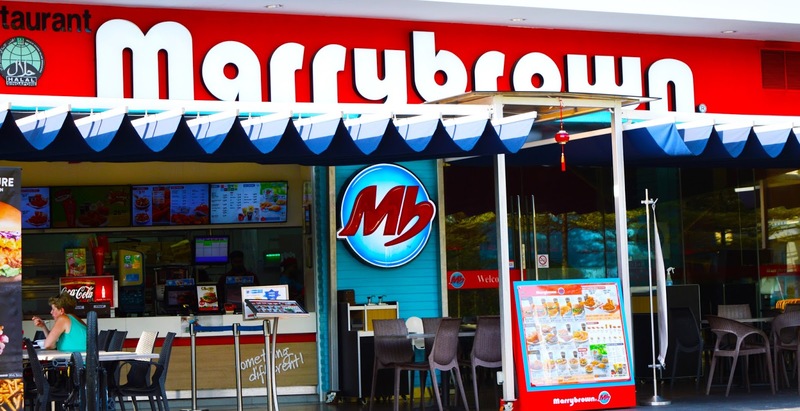 Dining options are also available here including one Food Court. Explore to get the best as per your taste. Our two days at Sentosa Island were enough to give us an entire distinct experience for our lifetime. Make sure you also get your experience pen down to remember it for lifetime and also share some of them with us. I was never aware with such things about this island where I have been wondering to visit from a while. Once you are having awareness about the atmosphere you are always able to enjoy the moment.